Explanation: A false-color x-ray image inset at upper left reveals emission from a cosmic jet of high-energy particles, 100,000 light-years in length, emerging from quasar GB1508+5714. An estimated 12 billion (12,000,000,000) light-years away, this appears to be the most distant energetic jet in the known Universe. Astrophysical jets of many sizes seem to be produced in a range of environments where significant accretion, or infalling matter is thought to arrange itself in a disk, from contracting star-forming clouds to supermassive black holes in active galactic nuclei. 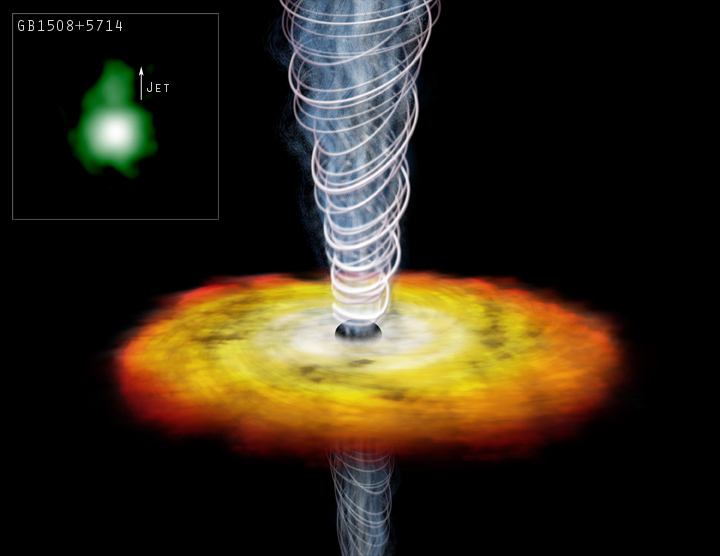 Here, as depicted in the illustration, the accretion disk is thought to surround a supermassive black hole, accelerating particles to near the speed of light in two jets at right angles to the disk itself. In the case of this quasar, the jet tilted towards us is visible in x-rays as the particles collide with low energy photons from the cosmic background radiation. The collisions boost the photons to higher x-ray energies and scatter some of them in our direction.